Sarah Darville Yael Carmel (center) tries out a bike. The 7,000 bicycles that will hit the road when the city’s bike share program launches at the end of summer were meant to be sturdy and hard to topple. 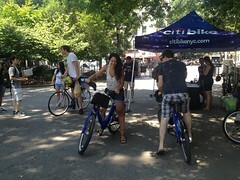 “They’re a bit like a tank,” remarked a Citi Bike employee who showed some of them off at Tompkins Square Park today. So when Yael Carmel wobbled and nearly fell off of one of them, she had to laugh. It was one of her first times on a bike after recently learning to ride, she admitted. The employee steadied her and she was off toward Avenue B. The city just released it’s plans for bike share locations in the city, and the East Village has 27 stations as far east as East Sixth Street and Avenue D.
Ray LeMoine A bike-share display at Tompkins Square Park. The Department of Transportation said that the map is a draft, and could change. At each location, dubbed Citi Stations thanks to a $41-million sponsorship deal with Citibank, cyclists can rent a ride and then drop it off at any other station. Astor Place, Tompkins Square Park, and three blocks of East Seventh Street are all slated for shares. The base price is $9.95 per day, $25 per week, or $95 per year for an unlimited number of half-hour rides. Users who want to sign up for longer rides pay an additional $4 for hour-long trips, or another $13 for trips of an hour and a half. And so on. Since late last year the city has solicited opinions on where the share locations should be built. 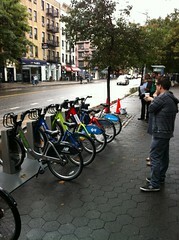 The first bikes should hit the streets by late July, and next summer 10,000 bikes should be docked at 600 stations. A new citywide bike share program will debut next summer, and the Department of Transportation is asking for input regarding where the distribution stations should be set up. The map, which went live today, shows that people have already suggested bike share spots at Tompkins Square Park, Cooper Square, and Sixth Street at Avenue C. Where would you like to see stations in the neighborhood (if anywhere at all)?